IN THE MID-1980S Carol Goland spent two years in the Andes. The subsistence farmers she studied in Cuyo Cuyo, in Peru, planted as many as 20 fields scattered around the mountain. They used up precious calories going back and forth between each field. Yet on closer inspection, this pattern had a logic to it. Crop yields varied widely from field to field, because of erratic microclimates. By spreading their bets the farmers reduced their risk of starvation. The farmers knew the penalty for failing to diversify. That lesson ought to be heeded in investing, too. But it isn’t. Three-quarters of equity funds in America are held in shares listed there, according to Morningstar, a data-tracking firm. American stocks have beaten a broad index of other rich-world stocks in seven of the past ten years. Even so, it is a lot of eggs to have in one basket. Those who seek to diversify by buying a global index find they are still heavily exposed to America. American-listed stocks account for 55% of the value of the MSCI All-Country World Index, a widely used benchmark. When the harvest in one place has been consistently good, people are reluctant to look elsewhere. But wiser investors follow the practice of Peru’s mountain farmers and spread their bets far and wide. America’s stockmarket cannot outperform forever. When the investment climate changes, a heavy tilt towards a single country can be costly. In principle, investors would be best off holding a broad range of equities from many countries. In practice, they have a tendency to favour their domestic market. This “home bias” is a puzzle. Domestic equities are a poor hedge against one of the biggest hazards to wealth—the loss of a job due to a faltering economy. Of course, many firms listed in America have substantial foreign earnings. But the risk-diversification they offer is still limited. Home bias, it seems, is mostly a quirk of behaviour. Investors think of foreign stocks as more risky than they really are. In any event, it is not so easy to follow a spread-your-bets approach. MSCI’s global index is weighted by the market value of its constituents. America looms large in it. This is in part because the world’s most valuable stocks are listed there. But it also reflects the nature of business ownership. In America big companies tend to be public. In other places many are family-owned. How open a country is to investors must also be allowed for. China’s weight is tiny because its market is less accessible. And the same question invited by those field-scattering Peruvian farmers also arises. Why bother? After all, it is America’s stockmarket that makes the global weather. Were it to crash, it would take down other markets, too. Research by Cliff Asness, Roni Israelov and John Liew of AQR Capital Management finds that in a panic, all markets get trampled. In October 1987, when American stocks fell by 21.4%, a global portfolio of 22 equally weighted equity markets fell by 21%. Over time, however, returns are driven by fundamentals in each economy, and the global portfolio performs better than the worst-hit individual market. A portfolio that is weighted by market capitalisation, like the MSCI index, is a less potent diversifier. But it is still far better than being over-exposed to one bad market. Those seeking the ideal balance of risk and reward should prefer to own shares of firms in proportion to their importance to the world economy. But ordinary investors should also like to keep things fairly simple. 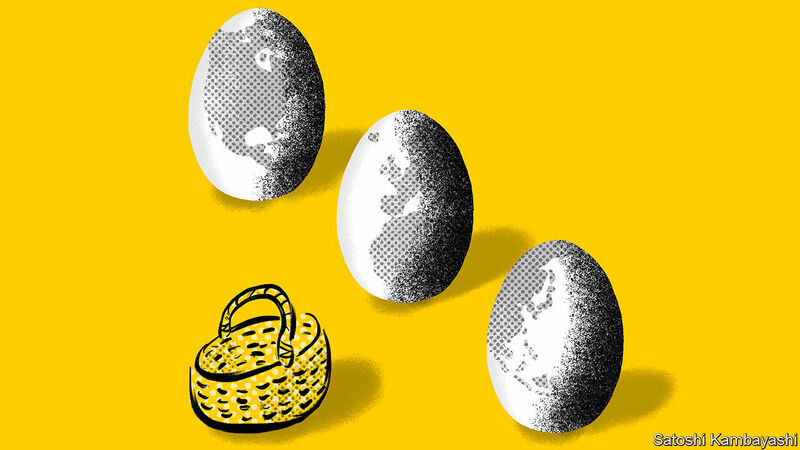 A good investment rule, then, might be to allocate a third of an equity portfolio to American stocks, a third to an index of stocks listed in other rich countries and a third to emerging-market shares. Such a portfolio would better reflect the make-up of global GDP. It would cap exposure to any one bloc. And it would anticipate a secular shift. As more emerging-market stocks are added to the global index, says Victor Haghani, of Elm Partners, America’s weight will diminish. Investors following such a rule must sacrifice some of the ease of buying and selling American equities for somewhat less liquid markets. The other big drawback is that when American stocks do especially well, a more diversified portfolio has lower returns than the global benchmark. Peruvian farmers would be prepared to live with that. By spreading their bets, they suffered lower yields than they would have had they only planted in the best field. But they could never have been sure in advance which was the right field to pick. Brazilian President Jair Bolsonaro’s environmental approach can be summed up in one word: exploitation. This will be devastating not just for Brazil – where tens of millions of citizens depend on the Amazon for food, transportation, and livelihoods – but also for the rest of the world. SÃO PAULO – Last month, a deeply divided Brazil voted to elect its next president. Faced with a choice between Fernando Haddad of the leftist Workers’ Party and the right-wing extremist Jair Bolsonaro, Brazilians chose the extremist – an outcome that will have far-reaching consequences for the environment, among other things. With solid backing from the wealthiest 5% of Brazilians and rural landowners, Bolsonaro secured broader popular support by playing on people’s prejudices and fears. In his campaign, he targeted vulnerable groups and pledged to reduce or eliminate protections for minorities, women, and the poor. Meanwhile, he intends to loosen Brazil’s restrictive gun laws, claiming that allowing average citizens to arm themselves will stem rising crime. As for the environment, Bolsonaro’s plans can be summed up in one word: exploitation. For starters, he wants to reduce or eliminate environmental protections in the Amazon, the world’s largest tropical rainforest. And he intends to reduce substantially the protection of indigenous lands belonging to the descendants of the Amazon’s original inhabitants. He will ease environmental restrictions on the use of pesticides and on licensing for infrastructure development. “Where there is indigenous land,” Bolsonaro once said, “there is wealth underneath it.” With that in mind, he has declared that no more indigenous reserves will be demarcated, and existing reserves will be opened up to mining. Bolsonaro’s agenda will hasten environmental degradation dramatically. Imazon, a Brazilian NGO, reported 444 square kilometers (171 square miles) of clearing this past September, an 84% increase over September 2017. The 12-month total amounts to 4,859 square kilometers, the highest level since July 2008. Brazil’s national space research agency, INPE, also reports an uptick in deforestation – about 50% year on year in September. As it stands, many of the farmers or loggers who exploit the Amazon do so illegally, risking fines or sanctions. The expectation that the new government will not enforce laws prohibiting such activities is probably already emboldening them to intensify their activities. 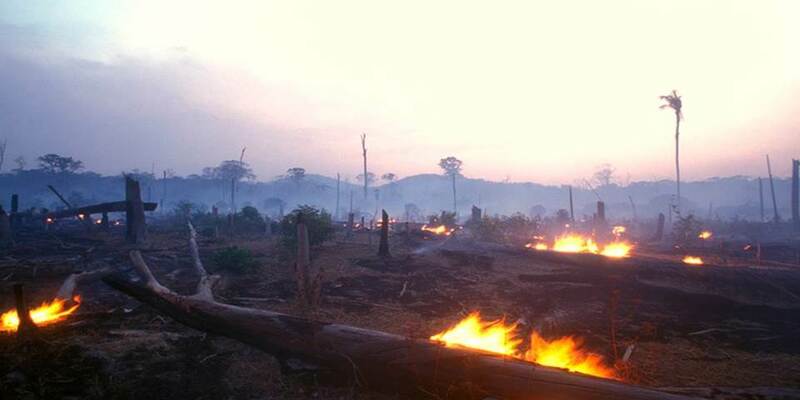 Once those laws are weakened or abolished, deforestation can be expected to accelerate considerably. The government’s apparent inclination to boost activities like gold mining in the Amazon will only make matters worse. There is little reason to believe that Bolsonaro will not be able to follow through on his destructive environmental agenda. After all, far-right representatives allied with powerful business lobbies dominate Brazil’s new congress. To make destroying the environment even easier, Bolsonaro has pledged to merge the environment and agriculture ministries, though he has since backtracked on this issue. He is now looking for an environment minister who is allied with the ruralistas, or large landowners, and has appointed a minister of agriculture who wants to lift restrictions on the use of dangerous chemical products in agriculture. Bolsonaro also promised during the election campaign to withdraw Brazil from the 2015 Paris climate agreement. Though he has since backed away from that pledge, he has just appointed a climate-change-denying, anti-science diplomat as foreign minister. That will present certain difficulties for Brazil’s bid to host the UN Climate Change Conference (COP25) next year. Beyond increasing the vulnerability of Brazil’s natural resources to commercial exploitation, the inevitable cuts to the environmental budget under Bolsonaro’s leadership will undermine the country’s ability to respond to disasters like forest fires. Brazil has already had an uptick in such fires – and fire-related destruction – owing to the expansion of agriculture, weaker oversight and surveillance, and the dismantling of fire brigades. Bolsonaro’s plans will exacerbate the problem. And this is not the only problem that Bolsonaro’s agenda will worsen. Socioeconomic inequality will increase. As the government hands more power over the rainforest to large business owners, ordinary citizens – including smallholder farmers and poor urban dwellers – are bound to suffer. But Brazil’s ecosystems matter for more than just that country – it is the guardian of the planet’s largest tropical rainforest, a repository of ecological services for the entire world, where most of the Earth’s biodiversity is concentrated. The Amazon is home to more species of plants and animals than any other terrestrial ecosystem on the planet, and its rainfall and rivers feed much of South America. Moreover, its hundreds of billions of trees store massive amounts of carbon. Over the past 100 years, Brazil has reduced the Atlantic Forest by more than 90%, and cleared 50% of the Cerrado and almost 20% of the Amazon. At a time when the Intergovernmental Panel on Climate Change is warning that we need to make urgent progress in reducing greenhouse-gas emissions, Bolsonaro’s plans will achieve just the opposite. Unfortunately for Brazil and the rest of the world, there is no reason to believe that he cannot or will not implement them. Paulo Artaxo is Professor of Environmental Physics and Head of the Department of Applied Physics at the University of São Paulo. He is an expert on the climatic effects of aerosols, particularly in Amazonia. Even with this huge increase in the monetary base, Fed Chairman Ben Bernanke has reiterated his goal not to repeat the mistakes made back in the 1930s by tightening credit too soon, which he says would send the economy back into recession. The strong correlation between soaring unemployment and falling consumer prices in the early 1930s leads Mr. Bernanke to conclude that tight money caused both. To prevent a double dip, super easy monetary policy is the key. In 1930-31, during the Hoover administration and in the midst of an economic collapse, there was a very slight increase in tax rates on personal income at both the lowest and highest brackets. The corporate tax rate was also slightly increased to 12% from 11%. But beginning in 1932 the lowest personal income tax rate was raised to 4% from less than one-half of 1% while the highest rate was raised to 63% from 25%. (That's not a misprint!) The corporate rate was raised to 13.75% from 12%. All sorts of Federal excise taxes too numerous to list were raised as well. The highest inheritance tax rate was also raised in 1932 to 45% from 20% and the gift tax was reinstituted with the highest rate set at 33.5%. But the tax hikes didn't stop there. In 1934, during the Roosevelt administration, the highest estate tax rate was raised to 60% from 45% and raised again to 70% in 1935. The highest gift tax rate was raised to 45% in 1934 from 33.5% in 1933 and raised again to 52.5% in 1935. The highest corporate tax rate was raised to 15% in 1936 with a surtax on undistributed profits up to 27%. In 1936 the highest personal income tax rate was raised yet again to 79% from 63%—a stifling 216% increase in four years. Finally, in 1937 a 1% employer and a 1% employee tax was placed on all wages up to $3,000. Because of the number of states and their diversity I'm going to aggregate all state and local taxes and express them as a percentage of GDP. This measure of state tax policy truly understates the state and local tax contribution to the tragedy we call the Great Depression, but I'm sure the reader will get the picture. In 1929, state and local taxes were 7.2% of GDP and then rose to 8.5%, 9.7% and 12.3% for the years 1930, '31 and '32 respectively. The damage caused by high taxation during the Great Depression is the real lesson we should learn. A government simply cannot tax a country into prosperity. If there were one warning I'd give to all who will listen, it is that U.S. federal and state tax policies are on an economic crash trajectory today just as they were in the 1930s. Net legislated state-tax increases as a percentage of previous year tax receipts are at 3.1%, their highest level since 1991; the Bush tax cuts are set to expire in 2011; and additional taxes to pay for health-care and the proposed cap-and-trade scheme are on the horizon. In addition to all of these tax issues, the U.S. in the early 1930s was on a gold standard where paper currency was legally convertible into gold. Both circulated in the economy as money. At the outset of the Great Depression people distrusted banks but trusted paper currency and gold. They withdrew deposits from banks, which because of a fractional reserve system caused a drop in the money supply in spite of a rising monetary base. The Fed really had little power to control either bank reserves or interest rates. The increase in the demand for paper currency and gold not only had a quantity effect on the money supply but it also put upward pressure on the price of gold, which meant that dollar prices of all goods and services had to fall for the relative price of gold to rise. The deflation of the early 1930s was not caused by tight money. It was the result of panic purchases of fixed-dollar priced gold. From the end of 1929 until early 1933 the Consumer Price Index fell by 27%. By mid-1932 there were public fears of a change in the gold-dollar relationship. In their classic text, "A Monetary History of the United States," economists Milton Friedman and Anna Schwartz wrote, "Fears of devaluation were widespread and the public's preference for gold was unmistakable." Panic ensued and there was a rush to buy gold. In early 1933, the federal government (not the Federal Reserve) declared a bank holiday prohibiting banks from paying out gold or dealing in foreign exchange. An executive order made it illegal for anyone to "hoard" gold and forced everyone to turn in their gold and gold certificates to the government at an exchange value of $20.67 per ounce of gold in return for paper currency and bank deposits. All gold clauses in contracts private and public were declared null and void and by the end of January 1934 the price of gold, most of which had been confiscated by the government, was raised to $35 per ounce. In other words, in less than one year the government confiscated as much gold as it could at $20.67 an ounce and then devalued the dollar in terms of gold by almost 60%. That's one helluva tax. The 1933-34 devaluation of the dollar caused the money supply to grow by over 60% from April 1933 to March 1937, and over that same period the monetary base grew by over 35% and adjusted reserves grew by about 100%. Monetary policy was about as easy as it could get. The consumer price index from early 1933 through mid-1937 rose by about 15% in spite of double-digit unemployment. And that's the story. The lessons here are pretty straightforward. Inflation can and did occur during a depression, and that inflation was strictly a monetary phenomenon. Mr. Laffer is the chairman of Laffer Associates and co-author of "The End of Prosperity: How Higher Taxes Will Doom the Economy—If We Let It Happen" (Threshold, 2008). Vienna was the city in which OPEC met to plan the oil crisis of the 1970s, and where Venezuelan terrorist Ilich Ramirez Sanchez, known as Carlos the Jackal, kidnapped 60 OPEC representatives and their staff in 1975 and flew some of them to Algiers with a plane provided by the Austrians. He was working with the Popular Front for the Liberation of Palestine and had close ties to the KGB. He found refuge and a base of operations in Budapest, right across the border. Needless to say, Western intelligence was operating intensely in Vienna, looking for him and his KGB handlers, as well as other terrorists. What I didn’t get to see was the Vienna I had heard of in my graduate school days: This was the Vienna of the last years of empire and the time between imperial collapse and Anschluss. This was a time when Vienna was the intellectual and cultural center of Europe. It was the time of Wittgenstein, Freud, Klimt, Schoenberg and Schrodinger. Put another way, it was the time of philosophy, psychiatry, art, music and physics. Vienna broke open new ways of thinking, brilliant insights and preposterous ideas that couldn’t and shouldn’t survive. Great moments are filled with a handful of brilliance and a great deal of trivia. Vienna became the center of European intellectual life, but that life was aborted by the most powerful and preposterous idea of all: Hitler’s vision of the world he wanted to create. Ideas can kill, and his did. The coming of Hitler had another consequence. The brilliance and absurdity of Vienna was adopted by other countries, particularly the United States. The influence lasted. In graduate school, I wrote on Freud and Wittgenstein, declared myself incapable of tolerating atonal music and wasn’t smart enough to understand quantum mechanics. Still, the degree to which Vienna fed American intellectual life was stunning. Even later, when I came to Vienna and sat for long hours with the heirs of this tradition, I had a sense of inadequacy. They were part of the tradition of Viennese intellectuals, and I was not. Why do certain cities have these extraordinary moments of efflorescence? One reason is wealth. Supporting intellect requires leisure, and leisure requires wealth, whether through rich families or grants. It also, like Paris in the 18th century, requires confidence. France was powerful, and intellectuals fed off that sense of power. There must also be migrants and a culture of travel – something to drive home that the laws of your city are not the laws of nature. And there has to be, from this dissatisfaction, a sense that conventions are arbitrary and that new things are needed. Intellectual uprising walks a narrow tightrope between disruption and collapse. Vienna had all these things. It was wealthy, or wealthy enough to create leisure for some. It was powerful, though its power was fading. It was a city of Hungarians, Serbs and all the random wanderers of Europe, looking for a drink and a warm bed. And it contained those who harbored deep dissatisfaction with conventions, which became more rigid as the empire declined. Empires, once great and now on the edge, make for these moments. Among the great empires was the Habsburg Empire. It was a dynasty that once dominated Spain and came to rest in Vienna. Its tentacles spread to Mexico, where a member of the House of Habsburg, Maximillian I, became the emperor in the 19th century, only to be executed by Mexican revolutionaries. The Habsburgs’ greatest moment came in 1683 when the Ottomans, having conquered Budapest, moved west, past the Danube, to capture Vienna. From Vienna, they could have moved south to the Italian Peninsula, which was already under attack by the Ottoman navy. This would have given the Ottomans effective control of the Mediterranean, as well as access to Spain and France. It could have also made American history very different than what it turned out to be. But the Ottomans were defeated, largely through an alliance between the Habsburgs and other European powers. This accomplished two things. It stopped Ottoman expansion in Europe, and it began the Ottomans’ long retreat that ultimately led to World War I and the current reality. In the Balkans, the Ottomans’ control was fractured. The Serbs – the Ottomans’ most stubborn resisters – did not want to become a colony of the Austro-Hungarians. This was in part due to national pride and in part due to religion. The Catholics and Orthodox played a complex game with Muslims in the Balkans. Serbian opposition to both Turks and Austrians led to the assassination of Archduke Franz Ferdinand, and the rest, as they say, is history. The Habsburg Empire buffered all of Europe against the Turks, and it was, to a great extent, configured for this purpose. Unlike other empires that aggressively demanded the subservience of client states, the Habsburgs were far more liberal. They did not seek to exploit the regions under their control economically, preferring them to be relatively well-off. This way, they were prepared to stand against the Turks, having as much to lose at the Turks’ hands as the Habsburgs themselves. And when the Hungarians demanded independence in the 19th century, the Habsburgs made them equal to Austria. There are two kinds of empires: the kind that rules through ruthless exploitation, and the kind that seeks to induce allies into defending themselves through economic incentives. The Habsburgs did not pioneer this. But the came close to perfecting it. Some in the region still speak nostalgically about the Habsburg Empire, as if it did what the European Union has tried but failed to do. And some want to turn this nostalgia into policy. Take the Three Seas Initiative, for example. The initiative promotes integration of European countries stretching from the Baltic to the Black and Adriatic seas, including Austria, Hungary and several Eastern European nations. It’s seen as a supplement or even an alternative to the EU. Some proponents believe it could be a way to block Islamic migration and even Turkish influence on the Continent. Yet my mother also took refuge in Austria after I was born. She said the Austrians were both distant and kind. There was no sense of residual loathing or even resentment. Perhaps Hitler was just a bad dream we all had and then woke up from. Given that history always returns in Europe, perhaps the Habsburgs will come back with an empire ruling through indifference. And as the Austrians insist, they will speak German but will not be Germans. On Sunday, my wife and I attended a show at the Spanish Riding School featuring Vienna Lipizzaner performing horses. The horses are interesting because they are born black and turn pure white as they mature. (They reminded me of John le Carre’s “A Most Wanted Man,” in which bank accounts used to launder black money are referred to as Lipizzaners.) For my wife, this was a trip of a lifetime, as she grew up in Australia loving horses and riding her own horse. I, meanwhile, grew up familiarizing myself with money laundering. So, we both could appreciate the show. I was taken less by the horses than by the horsemen and horsewomen. Their discipline and perfect sense of place was extraordinary, particularly when saluting. The riders raised their arms to the brim of their hats with slow and utter control while sitting on a horse. They paused for a second at the brim of the hat, removed their hats in unison to the perfect point, and then together placed them back on their heads. It reminded me of superbly trained troops at a moment of significance. The grace displayed by the riders was magnificent beyond anything I had seen. It’s not enough to make one forget about Austria’s past, following Hitler down his path of destruction, either enthusiastically or through resignation. But it was a beautiful thing to see. As is St. Stephen’s Cathedral towering over the banal brands around it. Vienna is quite ordinary today. Like most cities since World War II, it has grown more similar to all the others than different. But it has a complicated history, magnificent and terrible. It sat on the edge of Europe and blocked the surge of Islam. It sat on the edge of the Third Reich and helped make it what it was. It nurtured the most extraordinary thoughts and bred nonsense as genius. It was the place where much of the Cold War was fought. The desire to be less than magnificent for the moment can be forgiven. It is decent, and in Europe, that is not a trivial thing.